You’ve put up some soundproofing curtains and yet its still too noisy in the area at night especially and think there’s nothing more once can do besides putting up ugly blocks of soundproof padding? Well guess again! You can put up dual curtains rod setups to help out! As stated lightly before hand on the site this can be a big helper against sounds / noise you don’t want coming into your house. Something like the following will get you started towards this awesome setup. Once you put this up then you can get those soundproof curtains in place. 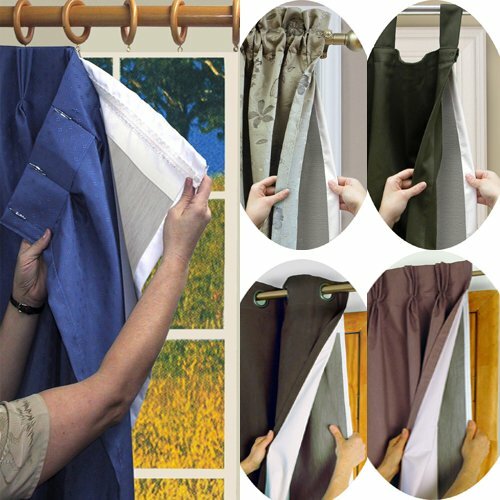 With the double curtain rod setup you can do a few options. If super noisy and you don’t care about seeing light come in or rarely look outside then definitely go with two very heavy soundproofing curtain setups, remember if unsure look for blackout curtains as they will typically help out most with blocking sound. If however you wish to let light in a bit at times or see outside when it may not be as noisy outside then get a nice heavy curtain and a lighter one. Avoid sheer as this won’t help block noise at all but with a lighter non-blackout curtain you’ll still be stopping some noise but definitely not as much. Does allow also to let some light and possibly look outside even if just a little. The best option on how to place your soundproofing curtains is mainly determined on who the heavier curtain or blackout curtain is. If both are of similar type then your choice and decision on which setup does the best job. However if one of the curtains focuses on soundproofing while the other doesn’t then put the soundproofing curtain closest to the window/door. This way more of the noise is blocked before it can continue through to the rest of the room. Another reason to do this is when you have the curtains open the soundproofing curtain is still along the sides where the most sound comes through and helps stop that. Good luck on setting up your awesome curtains! Right now just really enjoying my curtains from Best Home Fashion. After a few months use after purchasing them, the Burgundy(Burgandy as they call it) solid thermal blackout curtains do their job and do it quite well! We’re talking like wonderful blackout because I’ve had zero sunlight issues with them up. The quality is just so well done and its truly still a favorite for me. I’ve only liked one set better than this one so far. I do hope they last and I am currently deciding on purchasing another color since they have so many. For less than the 50 dollars I spent on them for the pair of curtains I’d say it was a good investment. Though it does have one downfall is that they aren’t really noise reducing/soundproofing curtains of sorts. Too skinny for that but that’s okay because the other features out weigh this downside of things. When I look at these curtains I like the black and white color with the zebra print. I like that you can also tie back the sides if needed. I also like that the sides look thick, so you can hang them down and they should block out the sun well. It has a micro fur feeling to it and its a two piece curtain set that is imported. One is sheer and one is a normal curtain. It’s also machine washable, so that makes it easier to wash if needed. Each panel is 60-inch x 84-inch with a 18-inch valance drop. Currently at a low low low price on Amazon right now! What first drew me to this curtain was the design. It is very elegant. There is a short layer at the top of the curtain that is designed. It zigzags across the top of the curtain and in between the zigzags is a silky piece that hangs down in folds. The gold color adds to the elegant look of these curtains and I also like the double layers. The bottom layer is lighter than the top which accents the whole piece. This is a 4 Piece Set for extremely low price, check it out below! What kind of curtains help to keep a room cool? With the insanely hot summer here you’re wondering to yourself, “what kind of curtains help to keep a room cool?” Well lets take a look deeper into the real problem of summer as there’s two main schools of thought of whats causing the warmth. Another thing to consider along side your curtains is just typical blinds. Usually a type of plastic of sorts these will help even more considerably because they are usually closer to the windows than what a curtain can do. Thus having both curtains and blinds will be a live saver in terms of keeping out the heat especially when you live in the southern states where the summers are brutal. Outside air can be an issue but its not as big of an issue as sunlight. Any curtains unless they are just pure thin silk will help alleviate warm air from coming in past the window. The thicker the curtain though the more protection you’re going to have. If you don’t get much sunlight but get really warm still. What to do really is not worry about curtains so much as making sure your windows are sealed tight. Feel around the edges of windows and if there’s any sort of air movement get out the calking gun or make sure to push down tight on your windows. Make sure that things completely close as even just a small amount of air flow can make a huge difference. Not to mention an increase in air conditioning costs!! If your windows are really worn down it may be a good idea to get replacements. It maybe a bit costly up front but it’ll save you so much money in the next few years especially if you have long summers. Newer windows in this day and age are wonderful in that technologically they are more weather proof, soundproof, and insulated to keep your summers cooler and your winters warmer. What to avoid: Silk! Silk curtains really won’t do you much good if they are super thin. They will help a bit if you’ve opened the windows and want to keep a bit of sunlight out just to air out the house. But they won’t do anything for you on those super hot days because the sunlight will still find a way right through them. Other options: Thermal additions like a curtain liner is another good alternative. These go behind your curtains to help insulate without having to replace your current curtain sets. Maybe you have that absolutely lovely set of curtains that work all year round and look great inside but during the summers they really don’t help out. Well you’re in luck because companies like Thermalogic make curtain liners to help out. You can purchase some of these here: Thermalogic Ultimate Window Liner for less than a typical curtain panel, especially compared to an expensive blackout set. Thank you all for reading and I hope you all have a fun and cool summer!